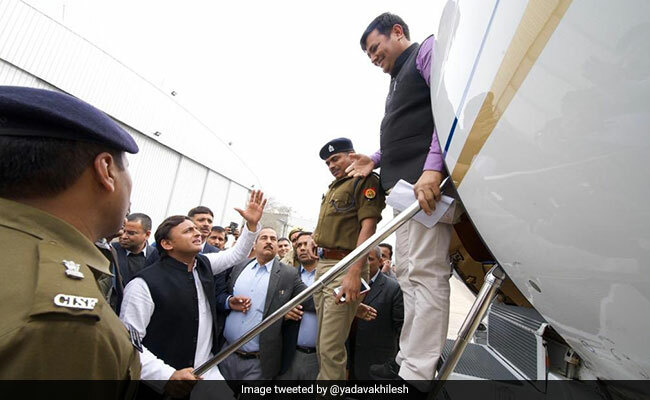 Akhilesh Yadav, former Uttar Pradesh chief minister and Samajwadi Party chief, today tweeted that he was "detained" at the Lucknow airport and stopped by the police from boarding a special flight to Prayagraj city, 201 km from Lucknow. He was scheduled to attend a function of the Allahabad University Students' Union this afternoon. Mr Yadav was planning to visit Allahabad University to attend the oath-taking ceremony of the students' union. The student wing of the Samajwadi Party, the Samajwadi Party Chatra Sabha, holds the post of president of the university students' union. "The government is afraid of oath-taking ceremony of a student leader and is stopping me at the airport to prevent me from visiting Allahabad," Mr Yadav said. He returned from the airport after he was denied permission to board the flight. The Prayagraj police said Akhilesh Yadav has been denied permission to enter the Allahabad University campus by the university administration, fearing law and order problems. "The police's job is to ensure that law and order is not disturbed , and that any action is taken to see to this," Allahabad police officer Nitin Tiwari's public relations officer told NDTV. The incident rocked the Uttar Pradesh assembly. As soon as Samajwadi Party legislators came to know about their national president being stopped at the airport, they tried to raise the matter during Question Hour in the assembly. "The present regime is trying to kill democracy and stop our leader from visiting Allahabad," party leader Narendra Verma said. In 2015, when Akhilesh Yadav was the chief minister of Uttar Pradesh, Yogi Adityanath, who was then the BJP lawmaker from Gorakhpur ,could not visit the university for a similiar students' union programme after prolonged protests by the Samajwadi Party's youth wing. In the last few days, students affiliated with the Akhil Bharatiya Vidyarthi Parishad(ABVP), the youth wing of the BJP's ideological mentor Rashtriya Swayamsevak Sangh (RSS) , have led protest marches at Allahabad University against Akhilesh Yadav's proposed visit to the university.